Dhaka 20 Mar, Abnews: National Economic Council Executive Committee (ECNEC) today approved a project to construct some 317 kilometres "border roads" on hilly frontiers with India and Myanmar along Bangladesh's southeastern hills with a key objective of tightening border security. 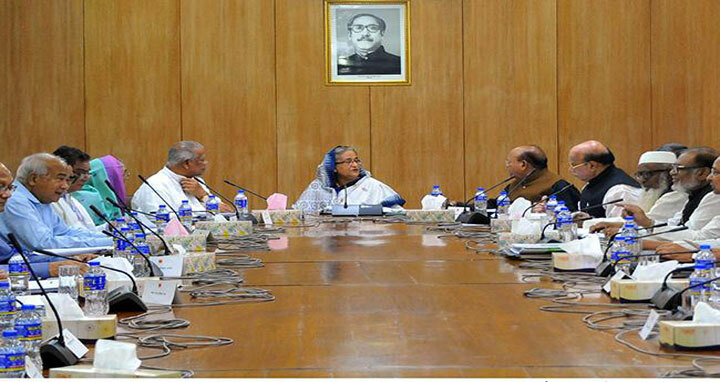 ECNEC Chairperson and Prime Minister Sheikh Hasina chaired the meeting held at the NEC conference room here. Briefing newsmen after the meeting with Prime Minister Sheikh Hasina in the chair, planning minister AHM Mustafa Kamal said the construction of the "border roads" in that particular region appeared crucial because of its susceptibility to weapon and drug smuggling and human trafficking. The project will be completed in six upazilas of Khagrachhari, Bandarban, Rangamati and Cox's Bazar districts by June 2021. The project will be implemented at Naikhongchhari upazila of Bandarban, Juraichhari, Borkol and Rajsthali of Rangamati, Ukhia of Cox's Bazar and Baghaichhari of Khagrachhari. Of the proposed 317 kilometres roads, 40 kilometres will be constructed on the Ukhia-Ashartoli-Fooltuli route, 52 kilometres on the Sajek-Shildah- Betling, 95 kilometers on Sajek-Dokanghat-Thegamukh, and 130 kilometres on Thegamukh-Loitongpara-Thachhi-Dumdumia-Rajsthali route. According to the minister, the scheme was one of the 16 projects approved by the ECNEC today involving Taka 9,680.05 crore while of them 12 were new projects and four others were revised ones. This was the 20th ECNEC meeting in the current fiscal, held at the NEC Conference Room at Sher-e-Bangla Nagar.On implementation of the project, border guards are expected to be able to ensure strict measures in hilly border areas, curb illegal drugs and arms smuggling through improved road communications. This project will also help expand trade and commerce, develop tourism facilities in hilly areas, facilitate marketing of agricultural products to boost economic activities and generate employment opportunities. The Planning Minister said 16 projects were approved today with an overall estimated cost of Tk 9,680.05 crore. Of the approved 16 projects, 12 are new while four are revised ones.